This October marked the sixth anniversary of Hurricane Sandy, the record-setting “superstorm” that wrecked parts of New York and New Jersey, and there is always the looming question: “What if it happens again?" The 2018/2019 storm season is expected to be slightly more active than average, and it’s only a matter of time before a new storm takes over the “Storm of the Century” title. We can’t stop what’s coming, but we can help homeowners living in storm-prone regions become better prepared for future bouts with inclement weather. When you pair a home solar system with a backup battery, you’re able to store excess electricity from the sun, giving you more independence from the grid. The solar energy you store in a fully charged battery can be used to power your essential appliances1 if the power goes out or when the local utility companies shut off access. Plus, you’ll also be saving money on your electric bill! During storms, the backup battery system acts as your energy reserve, offering much needed peace of mind. And a home solar storage battery can offer additional benefits in regions of the country that face “time of use” charges by reducing the amount of power you draw from the grid when utility rates are at their highest. EmPower Solar, the only SunPower Master Dealer and Tesla Battery Authorized Installer in the downstate New York region, pairs high efficiency SunPower solar power systems with a Tesla Powerwall to provide innovative battery storage solutions to homeowners in New York. 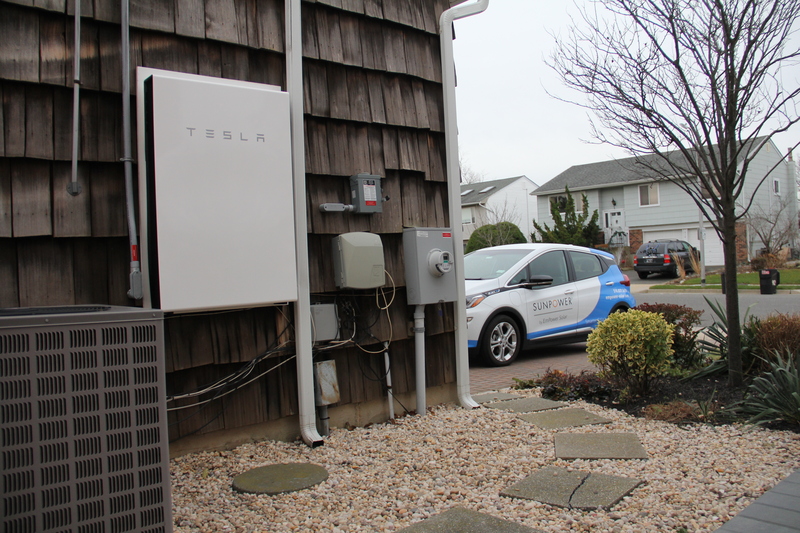 Just days after the company emerged from four feet of water from Superstorm Sandy, EmPower Solar was already servicing clients using electric vehicles and battery backup systems. With more than 2,000 solar installations and 100 battery installations completed on Long Island and in New York City, EmPower Solar is a proven leader in solar-plus-storage. If you’re considering solar-plus-storage for your home, it’s time to take the next step! Don’t let future storms leave you in the dark. Curious how much you can expect to save with a solar and battery storage system? Use the SunPower Storage Calculator to find the perfect solution. 1 "Essential Appliances” are determined by the homeowner before installation and typically include lights, select appliances and devices. The battery storage system should not be relied upon as a power source for critical medical devices. The life of the battery storage system will vary depending on a number of factors, including, but not limited to: the amount of energy stored in the battery, the amount of wattage used by the appliances and electronics connected to the battery storage system, the age of the battery, the battery’s ability. 2 #1 rank in “Fraunhofer PV Durability Initiative for Solar Modules: Part 3”. PVTech Power Magazine, 2015. Campeau, Z. et al. “SunPOwer Modules Degradation Rate,” SunPower white paper, 2013.